The bunad silver, like the bunad itself, is closely connected to the (Norwegian) district. There are numerous variations in technique and design. Filigree is the main technique of the Norwegian bunad silver tradition. Silver wires are curled, twisted, melted and formed into intricate patterns and designs. Small parts are built up to form the brooch, yielding great richness in detail (the sølje). Silver was always a precious material. The amount and quality of the jewelry worn demonstrated the one’s wealth and position in society. Poor people could afford to wear only smaller pins of simple designs if any at all. However, everyone needed something to hold their clothes together. Another reason to wear silver was the belief that the silver had magic properties, protecting against evil and disease. The craft was handed down generation to generation, providing additional income to less fortunate farmers. However, most of the bunad silver produced in the rural areas was done so illegally. The guilds in the towns monopolized the craft. That resulted in a large proportion of the bunad silver being unstamped. Today, as always, the bunad and the bunad silver demonstrates utmost craftsmanship. Quality and tradition are the hallmarks of the bunad. 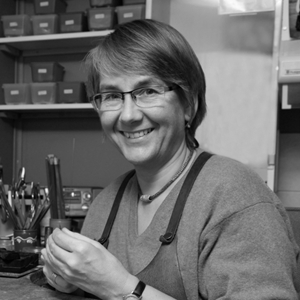 In 1980, Hilde Nødtvedt completed four years of apprenticeship in Oslo and the valley of Valdres, receiving her journeyman certificate. She studied Ethnology and Folklore at the University of Oslo (1984). She started her workshop in 1979. In the beginning, she was at the Norwegian Folk Museum. Fifteen years later, she moved her studio to her home in Oslo. The bunad silver is her specialty, and she makes bunad silver for most costumes in the country. The Folk Museum still calls on her about bunad silver and she led six apprentices to pass the renowned and difficult journeyman test. • 1999 EU Leonardo project and Janson’s Legacy (Awarded EU-Leonardo stipend for craftspeople, and with additional funding from the “Janson’s legat,” studying in Italy with an Etruscan granulation jewelry expert). • Awarded one-year work stipend (2000-2001) to finish a replica of an early 1800’s bridal outfit from Eastern Telemark. Displayed at the Norwegian Folk Museum, it is available for traditional weddings.